Brunch: It's between meals, anything goes, and best enjoyed on a patio with friends. It saves you from your hangover. It defines relationships (brunch together the morning after means you're basically engaged) and mends friendships (that tipsy spat doesn't matter once you're sharing hash browns). It's the meal that invented, then perfected the art of day drinking. It's made chicken & waffles, shrimp & grits, and bloody marys mainstream. Undoubtedly Memphis loves brunch, so here are the 12 places to get your morning swerve on in the Bluff City. 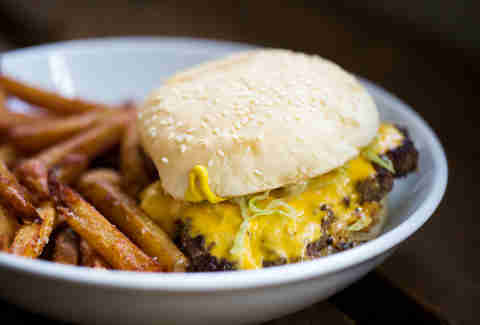 Bardog Tavern offers a brunching man's brunch: hearty, simple, and heavy on the meat and carbs. Get a New York Strip and eggs, pancakes, Fresh toast, or an avocado- and spicy mayo-laden lobster sandwich. Plus there are $4 Bloody Marys, mimosas, and "cheap screws" should you need some hair of the bardog. 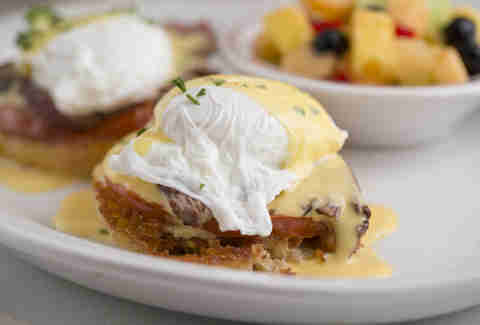 The Majestic Grille has the best of both brunch worlds, with equal style and substance. Enjoy live music on the mezzanine of the 1920s Art Deco theatre while sipping a carafe of mimosas and noshing on veggie frittatas. Or saddle up to bar to watch football and tear into a rib eye Steak & Eggs served with potatoes, biscuits, and a Bloody Mary. If the Mississippi Delta begins in the lobby of the Peabody Hotel, then the American Southern brunch begins at the buffet tables of the Peabody's Capriccio Grill. You have platters upon platters of Belgian waffles, eggs, smoked salmon, salads, pastas, steaks, and bacon, plus a impressive display of baked goods, desserts, and mimosas. Is it really brunch if there's no booze? Only if it's Brother Juniper's. The hour-plus weekend wait time and inclusion on every "must eat" Memphis roundup earns this quaint restaurant bragging rights. It's part family-run diner, part-cozy cafe, and the special roast coffee is not for java amateurs. Go straight for the open-face omelets like the San Diegan with portobellos, feta, and bacon or the Desperado with black beans, salsa, and avocado. Brunch gets a makeover at this Cooper Young hotspot, which is completely packed on Sundays with Midtowners looking for an upgrade to everyday omelettes. Try the Beneduck -- spiced, sugared crispy duck with jalapeño jam -- or country ham with red-eye gravy, green apples, and bleu cheese over eggs and hash browns. Spirits-wise, the Bad Boy Bloody Mary and the Big Boy Mimosa have you covered. 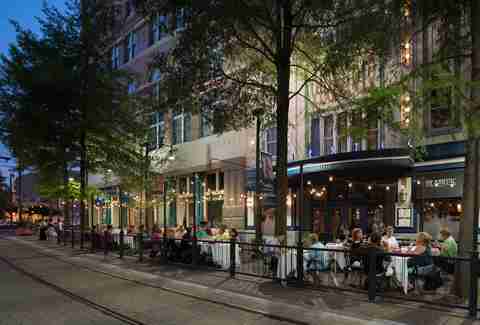 Char is the star of the newly revamped Highland Strip and the brunch is not to be missed. The brunch menu includes staples like crab Benedict, custard-fried French toast, and chicken & waffles. The full non-brunch menu is also available on Saturdays and Sundays, which means you can get a bowl of gumbo and crab claws with your mimosa. If you like jazz, be sure to reserve a table in the bar and enjoy live music from Le Tumulte Noir. 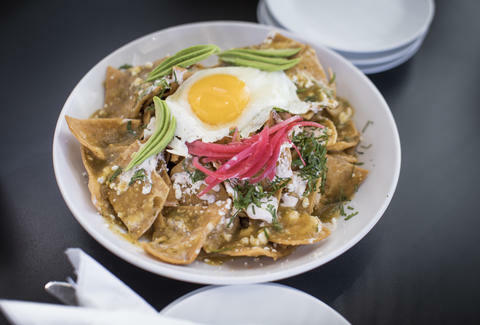 There’s a reason that Hog & Hominy is on damn near every “best of” list, and its brunch is no exception. 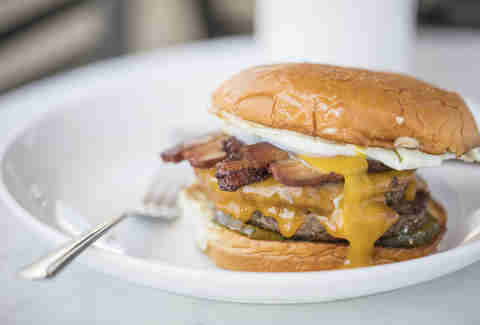 You can get Porcellino’s bacon in more than three forms, shrimp and grits, pancakes, biscuits and gravy, home fries, and favorites like the John T Burger and poutine fries. Drink specials are available for bloody marys and mimosas, but the cocktail menu features boozy iced coffee creations you shouldn't pass up. Plus, there’s outdoor seating and bocce ball. 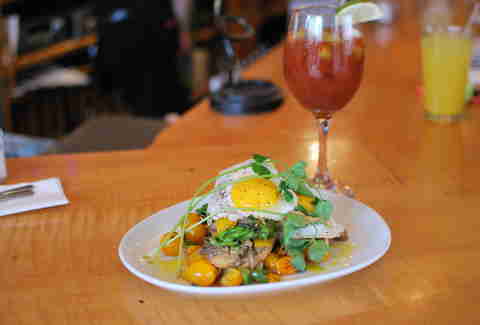 Ghost River’s Brunch at the Brewery from 12-4pm on Sundays is a great way to experience its gorgeous new taproom. Each week, Flying Sobie's is there with fried Cornish game hen, waffles, and fries. You can have your hen plain or choose among five different sauces -- we recommend Memphis Gold.The drink specials are also on point: Vice-mosas (Memphis Vice sour ale + OJ) and Bloody Beers (Grindhouse cream ale + bloody mary mix). For those who don’t like brunch to end and want to keep the party going, the taproom usually has live music (and a new food truck) starting at 5pm. The Gay Hawk is the perfect spot for soul food, good conversation, and fried chicken. The buffet is from 11am-5pm and features soul food favorites like the aforementioned fried chicken, greens, yams, and peach cobbler. There’s an incredibly friendly vibe and it’s not uncommon for folks to sit and enjoy the food and company all day long. For those seeking a prime patio experience while brunching, The Second Line delivers in spades. Not only will you soak up the sunshine, you’ll enjoy specials like The Boudreaux Benedict (buttermilk biscuit, hot sausage, poached eggs, crawfish milk gravy) and standards such as the brunch po-boy (Benton’s bacon, Cheddar, three sunny eggs, halfway dressed). Best of all, after a few cocktails it’s super-easy to convince yourself that you're actually on vacation in NOLA. 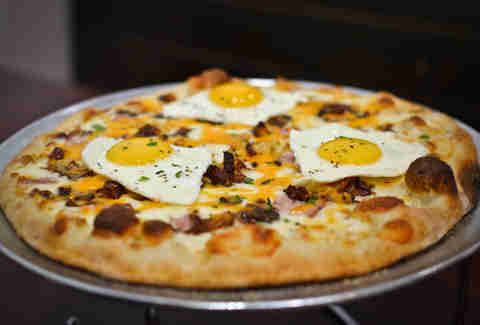 Rock'n Dough Pizza and Brew Co.
Two words that could forever change how you view brunch: breakfast pizza. Get all your breakfast favorites -- hash browns, eggs, bacon, cheese, and sausage gravy -- piled atop Rock'n Dough’s top notch, New York-style crust. And then shove your face full of beignets. To complete the meal, order a beermosa and rest assured you're living your best life. The Railgarten has been flooding everyone's newsfeeds with photos of its amazing backyard, rule-breaking-yet-ingenious use of shipping containers, tire art, ping-pong tables, volleyball court, and a death-defying tire swing. Luckily, the food is just as exciting. Breakfast starts at 9am and the menu features one of a kind items like waffles made with “Gotta Get Up” coffee stout batter, a morning corndog boasting a juicy sausage link, and breakfast egg rolls with sausage and cabbage. More traditional stuff like pancakes and biscuits are available too if you aren't feeling too adventurous after that big night out. Holly Whitfield is a writer in Memphis.